Shredding scissors cut print into unreadable scraps. It’s your best protection against identity theft! These shred scissors have ten blades to shred important documents instantly: checks, bills, bank statements, carbons, credit card receipts. Shredder scissors fit in a purse or briefcase. Steel scissors with molded plastic grips are 7 1⁄2" L.
Love this product. I use it for shredding my name and address on disguarded mail and documents before trashing. It is easier and better to use than my large electric shredder. I also use it for finely chopping herbs such as parsley and basil etc. Don't have to worry about paper jams or clogged cutters. Very happy with product and have recommended to friends. I have used electric shredders for many years, but they don't last long and they jam and overheat. Convenient for getting rid of all those junk mail addresses. I bought this to be able to quickly shred mail as soon as it comes in, without making any loud noise to wake up my babies when napping. It also, cuts herbs. I bought one and it works to shred papers but then I washed it and used it to shred fresh herbs. I bought another one! My brother begged me for it when he saw how I was using these scissors. Since he has RA, I couldn't refuse. One tip I will offer is, take a paper towel tube, flatten it and staple one end. After you've washed and dried the scissors, slide them into the tube. This will protect the blades and your fingers from knicks and cuts. I get hundreds of unsolicited address labels, and they jam an electric shredder. This is perfect. Even when it gets a little gloggd up, it is easy to clear. I love it. Bought on for my daughter, too. This is great for shredding in a hurry. Now I don't let things build up because I can do it immediately. Great for shredding parts of documents (name and address) that do not have confidential information throughout. Works great and doesnt take the space as a box shredder. Can cut a few pages at a time, removing staples. They are so easy to use I use them everyday for destorying addresses and account numbers on different things. This product is just what I thought it would be and so much more. I was confident of that so I ordered two (2). It is sturdy and well made. I use it when I need to shred a paper or an address off an envelope. 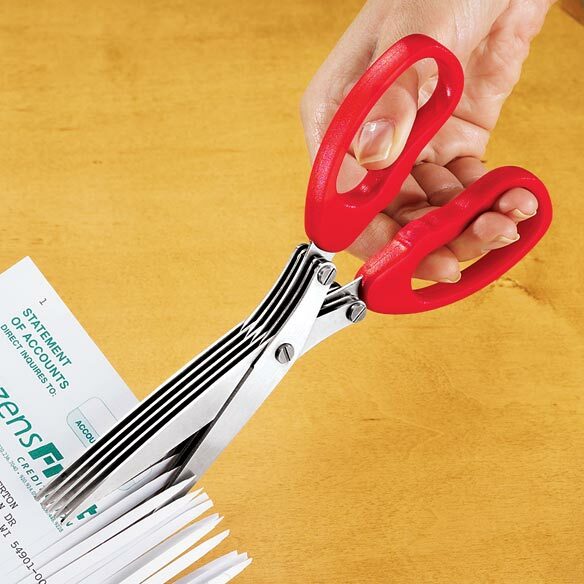 These scissors are great for shredding up everyday junk mail that has your name and address on it, such as credit card offers, as well as shredding up items from deceased family members, such as bank account statements, tax returns, etc. It saves a lot of time and it is faster and better than using your hands or a regular scissor. Also, it is better than an electric shredder because those breakdown a lot and have maximum times for shredding during which the machine needs to take a rest, however, these scissors keep on cutting as long as you want to. I am not usually a catalog/mail order person, but I saw it in the catalog and realized this is really a unique product that you can't find in any neighborhood store, so I am glad to have bought it. My mother wants to get these scissors for her apartment, too. Great product! this is grate if you cannot afford a electronic paper scredder.I have one but it got jamed and did not work finnlly got it working again.This sissor will not jam.handy to have for small anounts of shredding. They work better than regular scissors. I use this product for shredding old letters and new credit card applications and junk mail. I am very happy with this product and I cannot say anything bad about it. My new shredder scissors are great. I was expecting to use them to just shred a couple checks, but with the great design and strength the scissors have, I can shred several items at once. I even shredded my husbands old license! The shredder scissors are much more convenient to use than a paper shredder. They take up less space around the house too! I already have a pair of these scissors and am ordering another pair. The one I have I use for paper, credit cards, etc. Although it cuts in strips, you can always cut those strips = cheap cross-cutter. But the new one I'm ordering will be used just for food. It's a quick grater: I took a piece of celery, sliced it down about 4-6 times lengthwise, then used the scissors to cut those slices from one end to the other = instant grated pieces! You don't have to pull out your grater machine, or manual grater because this is quick and works fine = less cleanup. I'll be trying it on onions next. The only thing is that if using it for food, after rinsing under water, you may have a few grated pieces stuck between the scissor blades.........no problem.....running a thin knife between the blades will clear those pieces right out. a shredder can be very portable! My husband thought this would be helpful for me instead of having to go get the bigger shredder whenever I needed to shred smething. Use for small items for shredding. Saves on electricity. Great invention..Use when I need to shred some paper work before throwing away..Beats lugging my shredder downstairs for a few documents. Little messy but not too bad it held over a container or bag. Now I don't have to go turn the shredder on for just one or a few items. Very convenient. I love using this scissors to shred unwanted papers with my name on them. Comes in handy when needed spur of the moment without turning on a machine. Easily stores in a drawer like any other scissors. I sometimes use a paper clip or paper shaving to remove shreds stuck in the scissors blades, but not a big problem. I am so happy I get this shredding scissors. I really love my new shredding scissors it is fantastic. I use this to shred my credit cards and pharmacy papers. I also use it to create thin ribbons for decorating and curling.It does the job well. Takes up minimal space, but works well on the daily household lad of mail, cards, etc. I love it. Im using them to shred paper for Easter eggs. I Enjoy Being a Cutup! Love these shredding scissors. Much easier than getting our big shredder out and using it. These scissors will make grass for cards and miniatures much faster and easier. THANK YOU!!!! LOVE IT I WRIGHT A LOT OF CKS, NOW SOME PLACES ARE GIVING YOU BACK YOUR CKS SO WHEN I GET HOME I JUST SHRED THEM RIGHT AWAY, DON'T HAVE TO WORRY ABOUT ANY PERSONAL INFORMATION BEING USED. This is the best tool to have. It is so quick and easy to use. I bought these as a gift; I already have them. They are great for small shredding jobs. I get tons of catalogs and I don't like to throw them away with my name on them. So I use these scissors to cut out my information -- I jokingly tell my friends that my garbagemen don't know my name :-) They are also good for shredding gummed address labels, as the labels tend to gunk up a regular shredding machine. These scissors cut up the shipping labels from boxes along with the return label - all at once! Cut almost all the way through, turn and cut them into tiny pieces! Wonderful scissors! Bought them as gifts for family members, as well. Great for shreding all documents to elimanate social secuity numbers,account numbers,personal names on documents and addresses. Great for small identifying papers. I can hide the pieces in my regular trash. A WINNER in my book..!!! These shredder Scissors are great..!! Wasn't sure what to expect but decided to order them anyway. Sure glad I did. I use them to shred my address labels on catalogs that I'm finished with. I had been looking for these scissors for some time now. I was so happy to find them in your catalog. I ordered two pairs so that I can give one to my sister for a Christmas present. They work very well. No electricity required, no loud noise, compact. Great for shredding addresses on everyday mails. Great idea,but doesn't fit my larger fingers.Feel it must have been designed in a country where hands are much smaller.It doesn't allow you to cut many pieces at once without binding.Great product to have on hand for limited use,when needed. Good alternative to the shredding machine. I bought the scissors because someone in my building bought one and he said it was okay. Its easy to use mostly one sheet at a time. Two sheets or more doesn't seem to work and it jams. Also, it is better to shred at an angle instead of up, down, or sideways because the latter, you can still read the information you are trying for someone else not to read. Overall, it is a keeper. I use it to cut up items like address labels and other items that have adhesive backing. They work well. I have a shreader for the other junk mail. Purchased this item to shred junk mail and glad I did. Works great for shredding paper. Does not work on credit cards or thick items. Overall, I am very satisfied with the product. This is a good idea and works well for paper products. However, for the plastic address mailings, they don't work as well. I have this item very near where I open my mail. If there is anything I think needs shredding before discarding, I can do it myself. I wish the product made bigger cuts..the blades are fairly long, but multiple cuts are needed to shred each item. I like getting rid of things I want shredded when I want them gone: I don't have to store them & wait to haul them to a shredder bin/event where I have to trust them to shred my personal documents. However, because the product is so time-consuming, if I had a large stack of documents, I would have to go to a shredder bin. Overall, I'm glad I have this product for everyday use, and I recommend it highly. this really does the job that it says it would. I use these on an almost daily basis. As junk mail comes in,private documents that I no longer need are ready to be disposed of, I just grab the scissors and cut through my name, address, credit card numbers and voila, ready for the recycling bin. You don't have to cut up an entire document, just cut through the pertinent info. I love my scissor shredder. When I saw this product in the catalog, I thought of my 86-year-old mother immediately. She doesn't trust shredding machines to shred her name on junk mail finely enough. I bought her this for Christmas, and she loves it. Who would have thought they made such a thing! used to shred envelopes with name and address, also good on magazine covers with name and address. Scissors are very sharp and have stayed that way since purchase. Shredding paper, i like that i can easily grab and use them. I use to shred mail, especially junk mail . I recycle my paper and anything with my name and address on it gets shredded before it ends up in the recycling bin. Works well for smaller items! I would recommend it for others. We cut through a bag of peppers quickly , but I got thumb blister. I probably would by it again. Quality - works like advertised, easy to use but a little stiff when cutting, can only do a few sheets at a time. Don't expect these scissors to do the job of a commercial shredder, but they are great for removing account numbers, names and addresses from statments or receipts you wish to recycle. It's a bit time consuming, but hey! I'm retired and enjoying a life "without multi-tasking"! For shredding but does not. Work as well as I thought it would. I love these scissors they are awesome! To shred important outdated documents and cards. I don't need a shredder. The area for the thumb needs to be a little larger. Use when you get offers in the mail about charge cards, blank checks, etc. It is nice to have a tool that is small enough to grab when sorting mail to get rid of junk mail with personal information that could threaten identity and security as soon as you bring it in from the mail delivery. It works on a single layer of paper best without jamming. To eliminate all those address labels that need to be destroyed for the elderly. Protection from identity theft! Handles too few things at any given time. I just got these scissors a few days ago. I have read from previous reviews that they do not shred credit cards. That is the first thing I tried them on to see exactly what happens. I was able to make them work on the cards, but it was quite difficult. So far, I have only used them on my old credit cards, and they did jam up a bit. If I had this much trouble with using them on my credit cards, I would certainly not recommend them to be used to shred CDs. They would probably work better on paper. Sadly these did not work as well as I expected. They were VERY stiff. The scissors did not cut as long a path as I had hoped. OK for small strips. Hard to actually cut anything. I tried using it to cut up some mailing labels and had trouble cutting through. This product is a wonderful idea. I use them to shred documents and return address labels that cannot be put through a shredder. I was disappointed they weren't sharper, but am learning to compensate. I got this product to give as a gift. Not sure how the person liked it. I did find it cheaper elsewhere as was sorry I didn't investigate it further. I have wanted this item forever. I keep it right by my mail drop to cut up any labels and personal info. My fingers don't fit well in the holes. After one cut it gets clogged and you can't finish the length of the blade. Constantly cleaning the blades. Use single layer only and cut right over the trash can otherwise...what a mess. I have a cross cut shredder so I guess I am spoiled, but this is ok for quick use. The only thing this is good for is shredding those old credit cards. Paper easily jams in between the blades, and can only cut through 2 sheets of paper with difficultly. Good for shredding old checks; however,scissor tends to clog if too many pages are used, and then hard on the hands when shredding. Otherwise, in general, it's a handy gadget to have around instead of the larger electrical units. it's hard to cut the credit cards . The blades are not too sharp to cut the credit cards. Bought these to shred addresses of items shipped in plastic bags. Only good to shred paper, will not work for what I bought them for. Will not cut credit cards! I think that the idea is very good, but the execution leaves a lot to be desired. They are not substantial enough to cut credit cards, but will work well on thin paper or craft projects. They are too stiff to use. Takes too long to shred. Good idea. However, blades do not move easily -- is stiff and it hurts my hand to use it. Only cuts 1-2 pieces of paper at a time, which would not be a problem if it were easier to use. Will return it. I tried to use these to shred some old important papers to go ahead and recycle, and you could only shred about 2 pages at time. They ontinuously jammed, making it difficult to continue without cleaning out. Poorly made. Did not work. Total waste of money. Don't cut anything. Was hoping to use them to shred checks, but will not cut satisfactorily. Waste of money. Anything more than 1 piece of paper at a time too time consuming and jamming occurs often. I found nothing useful about this product. Worst scissors ever. Don't waste your money! I tried to shred a credit card, which is the reason I bought shredding scissors. The handle broke off from the blades 2 seconds into the cut and I didn't even cut half an inch into the card. I tried putting the handle back on and it immediately fell off again. So incredibly lame!! I gave them 1 star because it's not possible to give zero. However, these scissors are worth zero stars. THIS PRODUCT IS NOT WORTH THE MONEY. I purchased for my dad so he could shred his mail. These scissors were difficult to use. We could only cut one item at a time and the paper got stuck in scissor blades. Not worth it. I was so disappointed in the workability for credit cards that I returned the item. OK for cutting A piece of paper, but tried to cut a credit card, and could not. I was shredding old checks and got less than 200 account numbers and names shredded before these shredding sizzors broke. Could not do more than 2 at a time.. Total junk. First off you can only shred one sheet at a time and then it shreds it all over the place--very messy. Would not recommend this to anyone. THEY WERE HARD TO USE PERIOD!!!!!!!!!!!! JAMMED ALOT TOO WAS VERY DISAPPOINTED WITH THEM. I tried this shredding scissor on one sheet of paper. 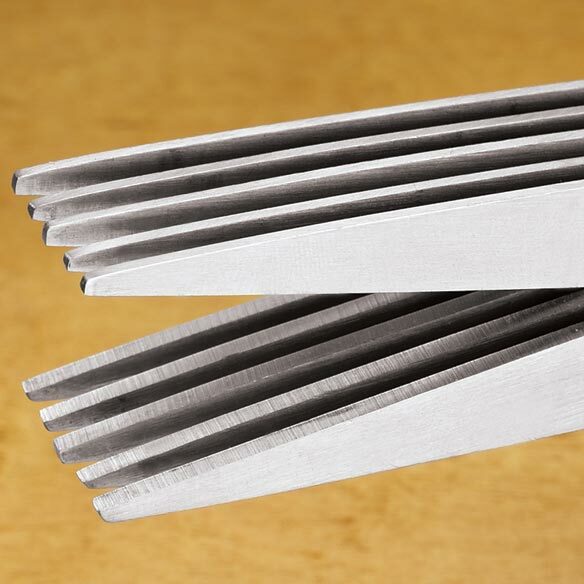 The scissor would not go after the first cut as the paper gets stuck in the blades. I originally bought it thinking it would help with salads but after the mess it made with one sheet of paper I doubt it will work for anything. Too expensive to send back so I'm stuck! When I cut into the paper to shred, it sticks and doesn't open back up so I can keep going. Have to pry the blades open to pull out what pieces did cut a little. This product is awful. It does not cut more than one piece of paper at a time, and even at that it won't go through any decent paper of any quality. Unless I am totally mising the boat on this product (and I did talk with a cust. svc. rep.), I am returning this product to Miles Kimball because it does NOT work "like regular scissors" as stated in the description. You cannot make a "continuous scissor cut" across any paper - you can only cut "around the outside edge" of any paper or document. Good idea for a product, but does NOT, again, does NOT work "like regular scissors"! These scissors don't work. They are not sharp enough to cut any more than a thin piece of paper. They won't cut into a credit card to shred it. This was a waste of money. Needed one instead of using a regular scissors. Unique. As long as it works well, it's the perfect solution to destroying small parts of documents that have account numbers or S.S. numbers on them. Need to shred mailing labels. I like the size of the shredding scissors because they will not take up a lot space on my desk but serve the purpose of shredding checks and small bills,etc. hopefully this will be easier than using a shredder. Will use this tool in my crafting! My mother is always worried about our information being public. I thought these shredding scissors would possibly put her at ease. To be able to keep my information private. some times all you need to shred is address and you can cut one way then the other and your done. I didn't really like them after I got them. I have a stamp that I cover my name/address and account number with. I like it better. To dispose properly of small documents. My husband likes to shred everything. Need something to shred some paperwork. So I can dispose of labels/other info on adhesive backing that will not go through my shredder. I wanted something to shred mailing labels or anything sticky that has my address on it that can not go through a shredder. This looks like it will be easy to use as soon as I open mail or finish with a sensitive document. I can shred just the portion that needs to be obscured and put the rest directly into the recycling bin. It looks like it will do what it is designed for. this is for smaller jobs like address labels instead of dragging out the shredder. Because of my work with victims it seems that it will be easy to shred by hand. There is no need for a large electric shredder if you need to shred something small. To save pulling out the large shredder. Because we use a lot of prescribed medications. This will make it easier to conceal our identity. Two pairs previously purchased worked well as gifts. THE NEED TO SHRED SMALL PIECES OF PAPER, AS NAMES AND ADDRESSES. I HAD ONE BEFORE AND IT MET MY NEEDS VERY WELL UNTIL I LOST IT.